Why are all those theories that the moon landing was staged suddenly coming to mind? Seriously, though, what is that? I saw this before. I searched for it again and never found it. Thanks for finding it. I would love to know what Wal Thornhill thinks of that! Hello All , I re-joined Thunderbolts after being zapped in the GWC/08* ,thanks for the replies. When I came across this , well it certainly had me scratching my head. Could it be a JPL/NASA April Fool's joke ? it looks to be a piece of MILLED TIMBER ! Which has much greater implications. If your talking about the slender dark object on the left middle, it looks very simply to be a piece of the broken stone looking things next to it edge on in the cameras view. Plasmatic wrote: If your talking about the slender dark object on the left middle, it looks very simply to be a piece of the broken stone looking things next to it edge on in the cameras view. No more of this "grainy," low-contrast stuff! Be careful not to read too much into it, there are a lot of artificial looking formations that are reported as natural http://news.nationalgeographic.com/news/bigphotos/7338411.html. I did say . . . . Interesting "story" you linked to Drethon , so the OPINION of some scholars is that mother nature shaped these stones in Peru , my personal opinion is . . . the verdicts out on this one as they look <- (LOOK) carved. The photo I linked to is not the one that first caught my interest , infact it was an image of the object zoomed in to point just prior pixellization . In the image I refer to the object, " APPEARS to be a piece of wood" , it has grain , so its possible its stone however the only stone I have personally seen that resembles this object was petrified wood ! I'm loathe to link to this image because of the peculiar nature of the content of the website however I'll look around for an alternative site with a close up of the object. Here is an image that "appears" to be a piece of wood , because it IS ! WhiteLight wrote: I came across this "very unusual" image from NASA . Any one on Thunderbolts come across this before ? Any one care to offer a theory ? As I'm a little perplexed ! Looks like a rock, or maybe a piece of wood? You just cannot draw any conclusions from that picture. I am leaning toward it being a rock, although maybe a piece of sedimentary rock? In itself, this picture is not proof of anything, imhop. There are so many interesting things around, it bemuses me that people pay such attention to so called artificial features on Mars. That`s why these things use not very high res still-image cameras and in black`n`white. The point is to lower the amout of data as much as possible. What, I wonder, is the bright object at the top left of the picture? I wondered if there was an electrical discharge that resulted in the apperance of that rock? I would like to know what Wal thinks. I think it's the remains of the cradle the Rover sat in during re-entry. The rover's tracks seem to lead back to it. "The striated and layered quartzite is sharp-edged and broken into angular polygons. The fissures running through the chaotic pile are filled with hematite dust. 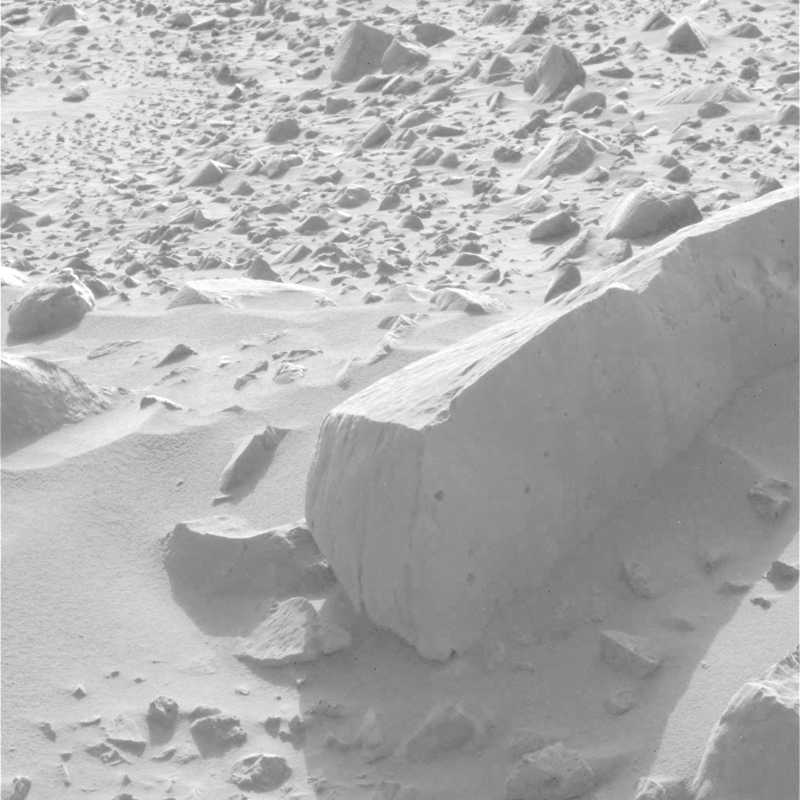 Close up images of the layered chunks show thousands of raised nubbins all over the exterior. When electric currents of gigajoule magnitude explode through the rock strata they blast the material out, forming great trenches. The debris falls back, creating big piles of distorted and half-melted minerals with no sign of how they could have been eroded into their present appearance."